Description: Boomerang for Gmail lets you take control of when you send and receive email messages and track who has read your emails. First, you need to download Boomerang on your computer. Click the big red button that says: ADD THIS TO YOUR GMAIL and follow directions for installation. Boomerang’s popular “Send Later” feature makes it easy for you to schedule an email to be sent any day and time you choose. You can draft your email now, then schedule it to be sent automatically at the perfect time. Just write the message as you normally would, then click the Send Later button. 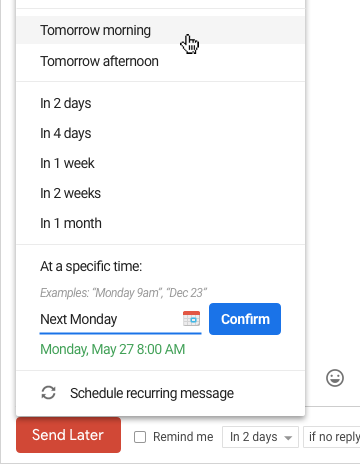 Use the handy calendar picker or the text box that understands language like “next Monday” to tell Boomerang when to send your message. There are times you need to make sure you follow up within a specific time frame after sending a message. You can select to only be reminded if nobody replies, or regardless. This way you won’t let messages slip through the cracks and will never forget to follow up with people. Also, you can now schedule your follow-up message as you’re writing the original email. If the person replies to your original email, Boomerang will detect the response, and will not send the second email. If they don’t reply, Boomerang will send the follow-up message automatically. You’ll never have to let another important email fall through the cracks. Use Boomerang to take messages out of your inbox until you actually need them. 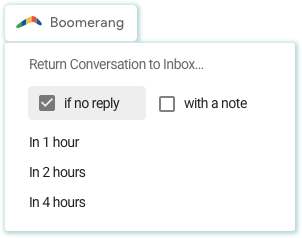 Boomerang will bring an email back to your inbox, marked unread, starred, or even at the top of your message list at the day and time that you choose. You’ve sent out an important email, and a couple days later, you still haven’t received a response. Was your message read and ignored, or forgotten; or was it buried in a full Inbox, never even opened? Wonder no more! 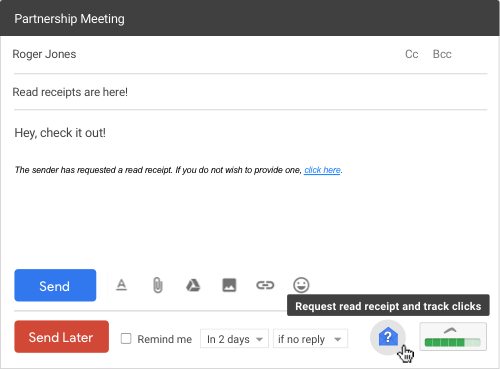 You can now request read receipts in Gmail, thanks to Boomerang’s new Read Receipt and Click Tracking features. Just click the Request Read Receipt and Track Clicks icon in the bottom right of the Gmail compose window. 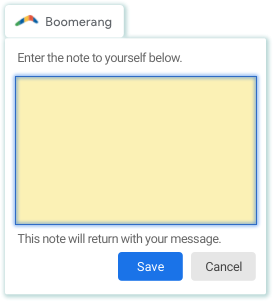 Boomerang will add a read receipt notification to the bottom of the message, and will also track clicks on any links you have included in the body of the message. Soon after the message is read, Boomerang will send you a notification that the recipient has read your message. You can easily view any information about your Messages to Send Later, Recurring Messages, and Tracked messages by going to your Boomerang Manage page. 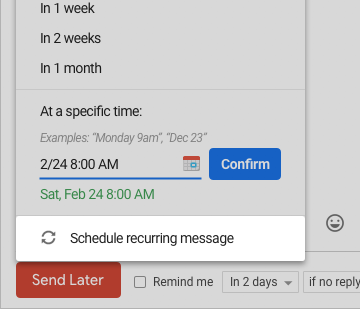 Click on the Boomerang icon next to the G Suite Tiles in the upper right hand corner of your inbox, then choose “Manage Scheduled Messages” from the drop down menu. There you will be able to manage all your Boomerang messages. Click on the different tabs to see more details. Previous story More with Epic Books!